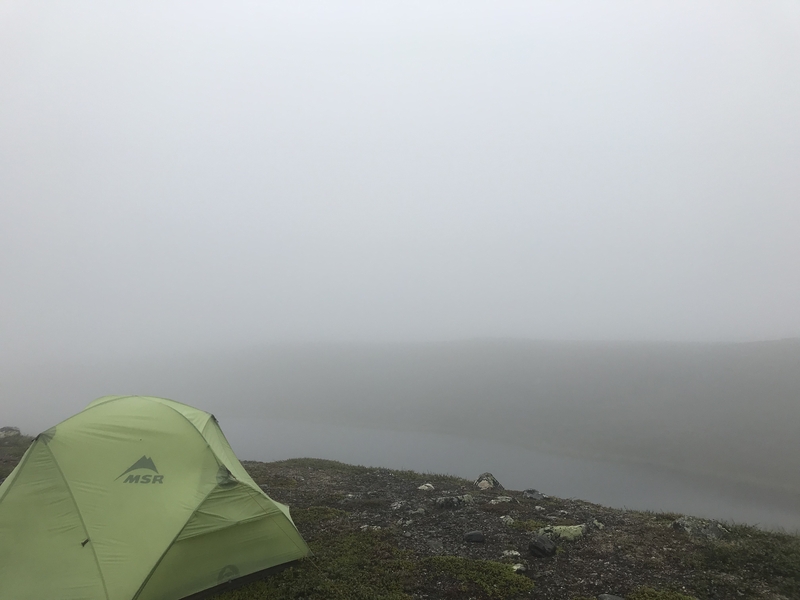 Once again I woke up early to the sound of rain falling on the tent, the weather had changed completely overnight and the beautiful clear evening last night had been replaced by thick fog and rain. Thankfully it stopped raining while I was going through my morning routine, still, the fog made it impossible to get the tent dry. Visibility was really low for the first half of the hike, yet the trail is so clear that it was super easy to follow. The weather didn’t invite to any extended breaks, still, I was in no hurry and took the time to look around for some mushrooms during the last few km, finding well enough for a good-sized snack upon arrival at the station. My package with food for the last 15 days of the tour had arrived and was waiting for me when I checked in after pitching my tent to dry in the air. I then kept myself busy throughout the afternoon sorting, repacking and taking care of equipment. Especially the boots needed some attention, cleaning and greasing to get them watertight again for the next part of the tour. Finally, I got to sauna, dinner and some socializing with other hikers before calling it a day and retiring to my, now completely dry, tent.